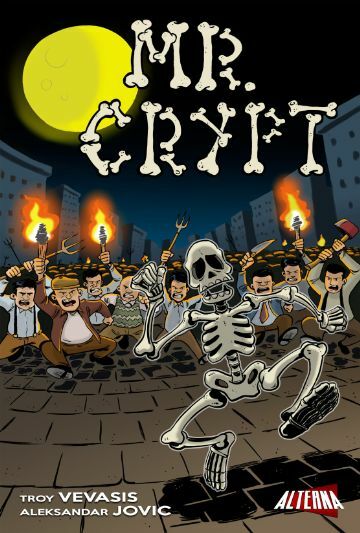 The Fellowship was fortunate enough to obtain a copy of MR CRYPT #1 from Alterna Comics. Troy Vevasis writes, and Aleksandar Jovic draws. A random lightning strike in a deserted cemetery has resulted in the most unlikely possibility – a skeleton has come to life. He’s a really nice guy, too, which doesn’t seem to matter to the townsfolk. But once he finds a disguise (a suit and a fake mustache) and comes up with a name, they seem to accept him. At least until the wind catches the mustache – then the chase begins again. One doesn’t usually think of walking skeletons when devising an all-ages comic, but this one really pulls it off. Mr. Crypt is a genuinely nice guy; he’s got a great attitude, he loves flowers, and he’s a pet person (even if the pet is a huge rat). That he’s an animated corpse is really just kind of an inconvenience for him. This is a really simple story, with the cleverness stashed away in the setting and the situations. And the art is quite good, with a style that’s somewhat reminiscent of Tintin and Bone. This book is by far the sweetest horror book I’ve seen all year. I like the possibilities for what this book could do, so check it out and share it with your kids. MR CRYPT #1 is available now on ComiXology.